The eye of a needle represents an allegorical portal of impossibility through which the participating artists employ symbology, gesture, and playfulness to push their subject matter. Their resulting works abound with multiple meanings and rich visual complexity. 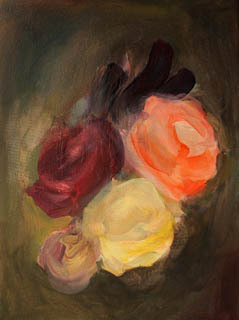 Kim Baker distils her classical and romantic subject matter through a series of sensory interpretations of colour and lyrical form. Her paintings expand this beyond an initial formal approach to gestural expressive brushwork, into an intense grappled world of floral painterly complexity. Baker has a BA in Fine Art from Birmingham University. Her work has been exhibited recently at Scope in Berlin and New York. Ben Walker similarly narrows his source material into an emotional response conveyed through painterly expression. But, contrastingly, Walker's instinct is to erase all but the most profound and essential details. Walker has an MA Drawing from Wimbledon School of Art. 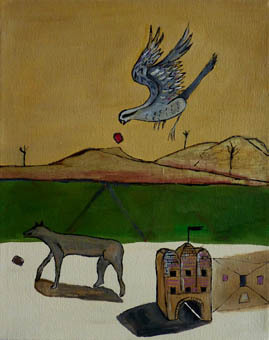 His work was selected for the 2010/11 Marmite Prize which toured to Central Art Gallery, Tameside; Lanchester Gallery Projects, Coventry; and The Nunnery, London. Louisa Chambers' paintings seem to present an alternative universe where authoritarian structures of technology/science fiction are hijacked by absurd anthropomorphic embellishment. 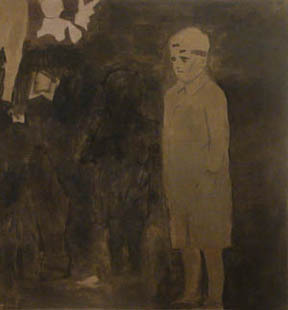 Chambers has an MA Painting from The Royal College of Art. Her work was selected for the Salon Art Prize 2009 and 2010 at Matt Roberts Art, London, and John Moores 25 at Walker Art Gallery, Liverpool in 2008. 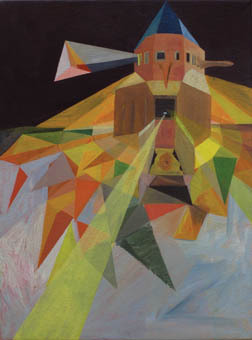 A feature about her work by Ruth Solomons can be seen in Garageland 13: Paint. Lisa McKendrick fills her paintings with quixotic imagery, which wilfully resists the laws of physics and eludes a readable narrative. For both McKendrick and Chambers, the needle's eye allows an intuitive playfulness, opening up a surreal psychological playground in which to set their imaginations free. McKendrick was born and studied in New Zealand before moving to London. She has shown extensively and in 2007 was selected for Jerwood Contemporary Painters.